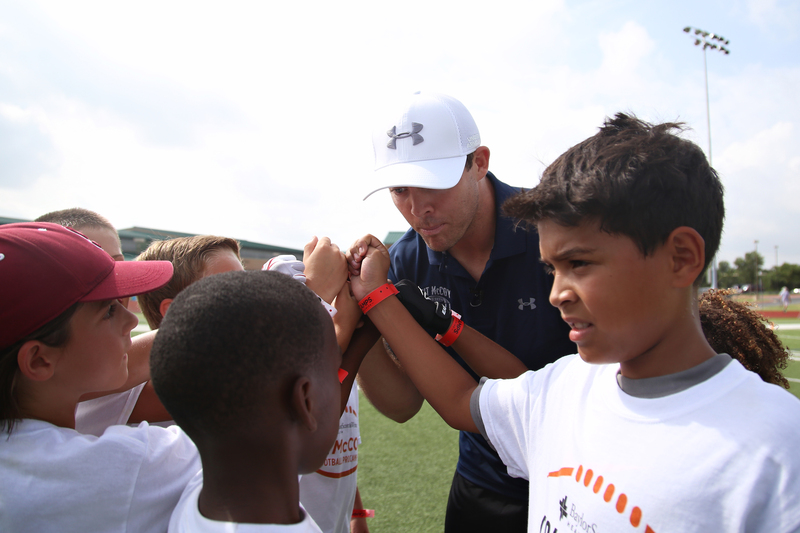 Children listen as former Texas quarterback Colt McCoy teaches them how to throw a football. McCoy and a selection of area prep and college football coaches are leading a camp of over 250 kids, who will experience various stations specializing in the fundamental skills of football. On the artificial turf of West Ridge Middle School, more than 250 kids partake in football drills that teaches fundamentals. One group learns the correct way to pitch the ball to a running back. Another group right next to them attempts to throw the football with perfect fundamentals: take a three or five step drop, plant forward with the left leg for a right hander — right leg for a left hander — and release the ball toward the target with a perfect spiral. 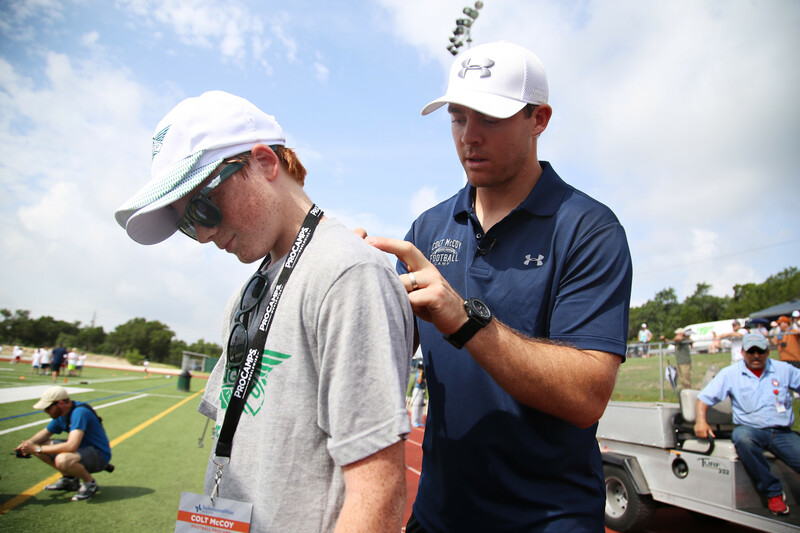 And in the sweat-inducing heat, legendary Longhorn quarterback Colt McCoy stops by different drills to offer pointers. A select few don a burnt orange No. 12 jersey, but some kids are too young to know who he is; to the older kids, though, his career at Texas seems like a dream. “It’s always a privilege for me to come back and put on a camp for all — especially the younger-age guys,” McCoy said. McCoy has been coming back to Austin — the city where he became a household name as he blossomed into one of the best quarterbacks in the country — for five years. But when it comes to going back to an NFL team, it seems to differ every year. In four seasons in the NFL, McCoy has been on three different teams. It will be the first time that he is back with the same team for consecutive seasons since 2011, when he was playing for the Cleveland Browns. “It was just nice to be back in the same system for a second consecutive year,” McCoy said. McCoy said that he had a chance to move on to different teams, but decided to stay put so that he could improve on certain skill sets, rather than spending the offseason learning a new system. He will go to Richmond, Virginia, for training camp July 28. But for now, he is teaching kids at his camp.